Make your home environment beautiful yet functional with our Kirov Motorised Curtain System. Tailor made just like our curtains, the system is fully customisable to match the requirements of your home or living space. Rid yourself of the need to manually open and close your curtains, especially large heavy ones where it is somewhat of a chore to move them. 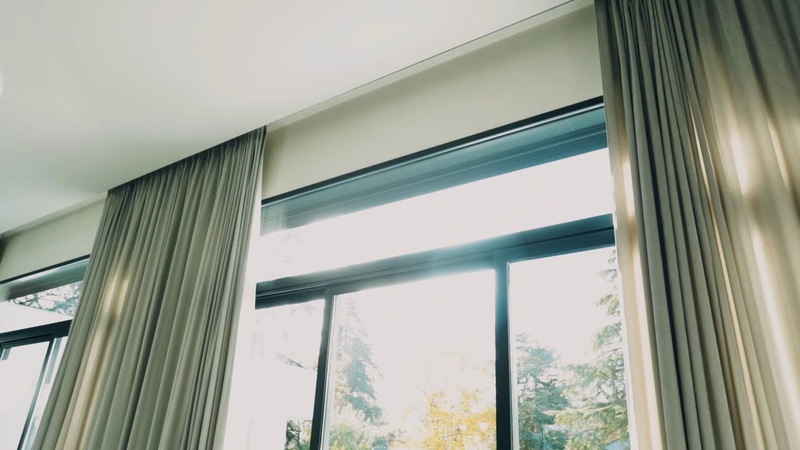 The curtain system also makes opening and closing curtains to be a smooth affair, eliminating frustrations especially when the curtain hook snags on the railing, which is a common occurrence when opening and closing manually. Just in case there is a power loss in your home, you can still let in light by using an external battery to power your curtains and make them open. We figured that this is an issue especially with older folks who are skeptical with electronic equipment. Now you can convince them not to worry. Built to move high ceiling or double volume curtains, our motorised curtain system is able to easily handle heavy curtain fabrics with ease. So no worries about whether the motor is powerful enough to move your curtains. To further ease its use, the system comes together with a remote control, making it easier for you to signal whether to open or close your curtains without actually being physically close to it. The opening and closing effect of your curtains are ensured to be smooth and mesmerising. It is part of the attraction to watch large or small curtains open and close by itself. The system is built to function without any extra need to service periodically. Tested with over 10,000 open and close movements, the system is built to last. You will hardly notice any noise made by the Kirov system. Using high quality materials and ball bearings in its construction, the system ensures smooth and silent operations that will not bother your peace at home. Built-in safety mechanism, the obstacle stop sensor will stop the movement of the curtains if it detects a usual increase in force needed to move the curtain. This protects the motor, railing system and curtains from any possible unwanted results. The curtains can still be manually pulled to its opened or closed positions when a total power loss to the motors occur. Also, with just a nudge of the curtains, the system will detect it as a signal to either open or close your curtains, without the use of the remote. Check out the photo gallery below for pictures of our work. If you wish to view more photos, visit our project reference page.